Why We Costume, Part 2: Because We Don't Have To. When I was in college, I got into dressing up in vintage and retro clothing. I tried to "live the lifestyle" that was Rockabilly - polka dot dresses, high heeled shoes, red lipstick, stockings with garters...all the time. I would walk to class and spend the day feeling quite pretty and often a little in pain. I'd field questions about why I was dressed up, why I wore "old lady clothes," what the occasion was, and so on. Usually my answers were along the lines of "because I wanted to," "because they're pretty," and "just because." My mother found this amusing. She told me she thought I was crazy, and that she had found wearing dresses every day quite tedious, and that she never could abide such an uncomfortable underpinning as a garter belt. 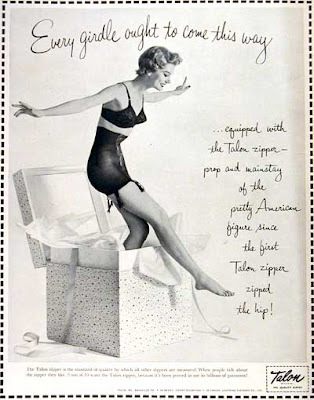 Girdles, BLAH; high heeled shoes, ALL the TIME? blah! However, there was a distinct difference: as a girl growing up in the 1950s and attending college in the 1960s, she HAD to wear those things. They were expected, required even. Myself? Naw, it was by choice. In the last thirty years, the restrictions and constrictions of ladies' clothing have disappeared. We can wear pretty much ANYTHING and get away with it, including men's clothes, ballet flats all the time, hats (or no hats! ), you name it. Fashion has exploded like an alluvial fan, sending its silts in every direction and providing us with an incredible number of styles to choose from. Compare this to the fashions of the past, where everyone was trying to achieve the same shape, and clothing, though creative within the bounds, stuck to pretty much the same style. Styles would change about every decade, with subtle transitioning periods (with the exception of the 1790s into the 1800s), whereas these days, styles change every year, and drastically every second or third year. So what is it about our fashion culture that makes us desire that of the past? I believe it has much to do with the FEELING of wearing these clothes, the way in which they make us move, stand, and hold ourselves. The clothing dictates our poise, our carriage, and often times our attitudes. When you dress up, you feel better. There is something magical about sporting a sharp skirt, clicking around in heels, or wearing a finely tailored jacket. When you add the element of *vintage* to it, it becomes something even more special. It's completely unique, for one, and the knowledge that you are wearing something exceptional is broadcast to everyone else, just in how you carry yourself in those clothes. Yet we don't HAVE to. That is exactly why we DO. Some readers commented that they wouldn't mind if fashion swung back towards those of the past, but I have to disagree. 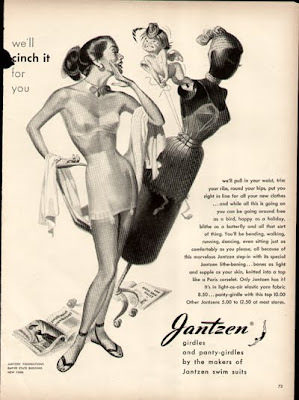 If we were required to corset every day, don incredibly restricting dresses (admit it, at the end of the day, you're happy to peel that long-line bodice off yourself), and try to function as modern women - doing sports, going to the grocery store, raising our own children, picking up dog droppings, working 8 hour office jobs, even just driving our own cars - I think there would be a violent, bloody revolution and quite possibly the apocalypse! To return completely to the styles of the past would mean a return to the LIFEstyles of the past, and that's something I doubt many modern women would truly want. So we pretend. And pretending is fabulous. Wearing our "new old clothes," getting a glimpse into how women (and men) felt in their own bodies, in the past, looking beautiful and carrying ourselves accordingly, is all a part of an experience that takes us as close to yesteryear as we dare get. 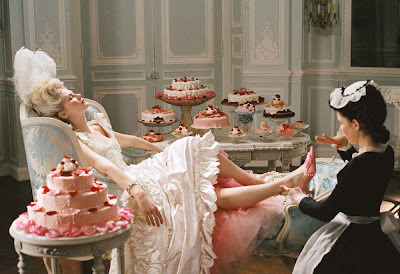 But ripping those clothes off and putting on a nice comfy pair of pajama pants and eating cake for the rest of the night?.........mmmm, it's good to be Thoroughly Modern, to indeed have our cake, and eat it too. I couldn't agree more. As someone who has worn a variety of styles from just about every era and quite a few cultures, the nicest part is knowing you don't have to. There's a reason that lower classes have always had less-restrictive clothing. That corset wouldn't seem like such a great idea after a week. I could not have said it better- I find as I get older (and I'm not telling) I think more about the clothes I used to wear-dressed up in really nice power suits with the briefcase and heels, blah blah. gave myself a horrific bunion. Now that I am a piano teacher, my taste in clothes has changed. and although i still consider myslef fashion conscious and very interested, I am not as quick to go and get the latest fad or wear the flavour of the moment. Of course, costuming has taught me the amount of work that goes into fabricating items of clothing, and I have a much greater appreciation for quality garments, esp vintage that have worn well! I totally agree, Margravine, about the appreciation of well-made clothing. Clothes today are throw-aways. They only hold up for a season anyway, but at least if we are all compelled by fashion to be trendy, we don't have pay all that much for it! (I'm a Forever 21 and Target addict, I don't go for expensive trendy clothes). I once wore a 1490s Italian gown, to a Halloween party, and a friend of mine, who had drawn the superman logo on his t-shirt and was wearing blue underwear, said, "hey, Lauren, don't you think you're a bit overdressed?" I just looked at him like he was stupid...he was, afterall, wearing JUST blue underwear. The next year he dressed as King Leonidis from "300" and was wearing JUST a black speedo and a whole lot o' baby oil. I would say he had a tendency to be, uh, UNDERdressed! Yes, yes, I totally agree - I was thinking as I read your title for this post that it's "because we don't have to" and also "because we can". Isn't it great to have a choice? In terms of wearing vintage clothes on a more every-day basis, I'd say this is similar to why people buy vintage or antique for their homes and bespoke for wedding gowns and things like that - these days everything is so mass-made it's rarely unique and is often not terribly well-made. With vintage you feel that you're getting something that you're not going to see on all the other 20-something women who shop at Top Shop or H&M. There's nothing worse (OK, slight hyperbole there, there are worse things, but in terms of clothes this is pretty bad) than feeling all lovely and dressed up and pretty, and then going out and seeing someone else in the exact same dress. With vintage you feel special because you're wearing something special and unique that is so well-made it has already lasted 20, 30, 40, even 50+ years. My pink 50s vintage dress is one of my favourite belongings for this very reason (and its uber-prettiness, of course!). I actually chose to buy a vintage cantileveler sewing box because the new ones I'd seen were wobbly and poorly made with missing handles (and that was before they'd even left the shop! ), while mine is lovely and sturdy. I suppose with vintage or hand-made or bespoke-made, we feel as if we are getting better quality, too (and IMO, we usually are). Another fab post, Your Grace - clearly very thought-provoking! Lady Thief, you are EXACTLY right! there is a huge resurgence of vintage and hand-made going on, and it's for this very reason, but also because people are beginning to rebel against our society of waste, and that means waste in clothing and material possessions as well. Things are not valued the way they once were - it's always the newest-hottest-latest, even when there's really nothing wrong with the version-model-type you have. Vintage and second-hand stores are popping up everywhere, and people are really beginning to appreciate well-made things of the past. I think they make us so happy because there is something human involved in their creation, no matter if it's a dress, a porcelaine figurine, or a setee. I think you are exactly right as well. In high school I was required to wear a dress or skirt and hose as part of our uniform. For many years afterward I wore jeans and shorts because I was so sick of dresses. Now I wear dresses and skirts again because I love them AND because I can make that choice! I admit it does feel good to peel off the corset and petticoats after a long day at Dickens, however fun it is to wear them. Ever tried to clamber into a pickup truck while wearing a full length gown and cloak? Well nigh impossible. Thanks Ladies :-D. Yes, and I'm sure women of past centuries felt the same way. I'm pretty grumpy having to put it on the next morning, though, hahaha. I really love this post. Often times when asked why I and friends do 'costumed events' whether they are private parties or public events through re-enactment groups I usually reply with this: Well, some people spend loads of money and time skiing or hiking or other pursuits. We spend loads of money and time recreating historically fashionable looks and short-term lifestyles. Its a hobbie, its fun! Why not, right? Anyway, it is our recreational drug of choice. Cheers! Angela, you're absolutely right! I guess it's just an "out of the ordinary" hobby. (I totally spend loads of money on skiing too, though, hahaha).